This backdrop support system is lightweight,heavy-duty and extensible for almost any application. Cross bar consists of four sections,making it simple to adjust the width. Light stands use quick single action locks,providing fast precision height adjustment. Hold muslin,canvas or paper and great for home and professional studio use. 6 x 9FT/1.8 x 2.8M Background,perfect for television,video production and digital photography. If necessory,please iron the back surface with steam iron but not dry iron. Heavy-duty carry bag:Provides you convenience to carry the kit anywhere. (1)8.5ft X 10ft/2.6M X 3M Background Stand Support System:The background stand is adjustable up to 8.5ft tall by 10ft wide.Made from aluminum alloy with a professional black stain finish. 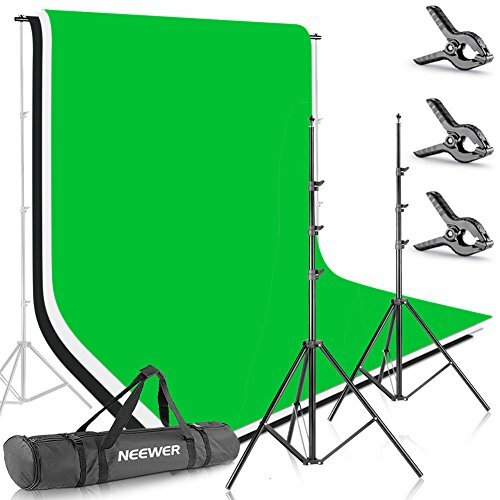 (3)1.8M X 2.8M Backdrop(White,Black,Green):Made of 100% pure cotton,good vertical sense and durable.Finished along all edges to prevent tears.It is perfect for television,video production and digital photography. (3)Background Clips:This clamp has a sturdy grip with gentle,pivoting pads that adjust to the grip surface.Small teeth on the inner diameter hold muslin cloth or paper backdrops in place for photo work. (1)Carrying bag:With carrying bag,custom designed for background support kit and photography accessories.